Meanwhile, diagonally slice onions; set green tops aside. In 12-inch nonstick skillet, heat oil over medium-high heat. 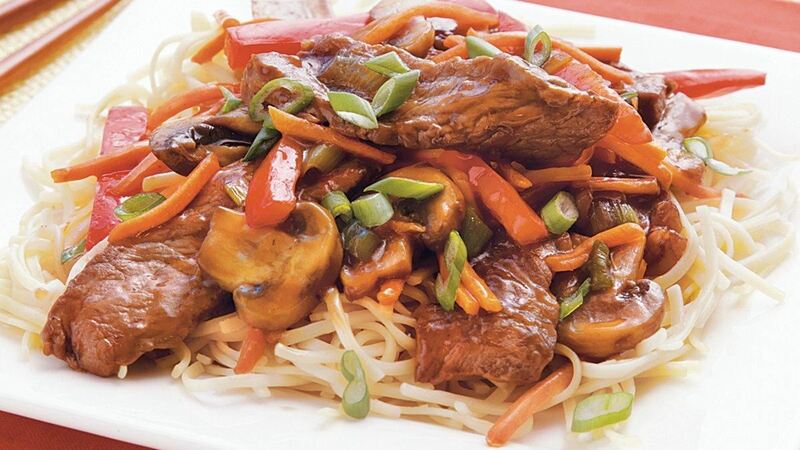 Cook mushrooms, carrots, peppers and white portion of onions in oil 5 minutes, stirring occasionally, until soft. Remove mixture from skillet to bowl; cover to keep warm. In same skillet, cook beef 1 to 2 minutes or just until meat begins to brown; drain. In small bowl, mix teriyaki marinade and cornstarch until blended. Stir teriyaki mixture and mushroom mixture into skillet. Heat to boiling over medium heat, stirring constantly, until sauce is thickened. In large serving bowl, toss noodles with beef mixture and reserved green onion tops. Serve immediately.